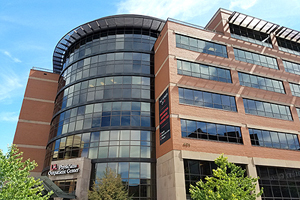 The UofL Physicians Outpatient Center is a state-of-the-art, multi-specialty health care facility, located at 401 East Chestnut Street in downtown Louisville. In addition to the specialty medical practices, the nearly 200,000 square foot facility includes an outpatient surgery center, an imaging center offering a full range of radiological diagnostic testing, a full-service dental practice, primary care, pharmacy, on-site laboratory services, outpatient rehabilitation center and more. A full time concierge service, transport service and convenient covered parking assure that each patient experience is as smooth as possible. Equipped with next-generation diagnostic and treatment technologies, the center is the hub for most Department of Medicine physicians. For more information, or to schedule an appointment, call 502-588-4600.